Define the datacenter for a cluster topology and add datacenters to a cluster. 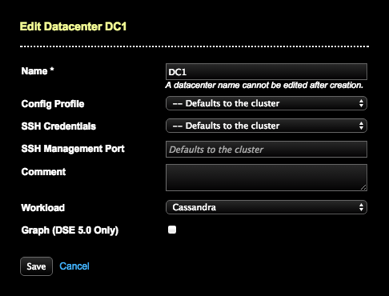 Note: Changing the name of a datacenter after the datacenter model was created and saved is not supported in DataStax Enterprise or Lifecycle Manager. The Edit Datacenter dialog displays. Depending on the edit, run an install job (if never run before; that is, an unconverged datacenter), configure job, or upgrade job at the datacenter level.